A repo (or repurchase agreement) is essentially a secured loan. A dealer sells government securities to investors, usually on an overnight basis, and buys them back the following day paying some interest. The repo market is a critical part of the financial system. It facilitates the flow of cash and securities around the financial system and it contributes to the efficient allocation of capital to the real economy. However, in the wake of the financial crisis, the dynamics in the repo market have changed considerably (Duffie, 2016). Liquidity in core repo markets has dropped, costs faced by some market participants have increased and a weakening of repo market functioning has been reported. It is argued that Basel III regulatory reforms, most notably the leverage ratio, played an important role in this (CGFS, 2017). In a new paper we examine whether this is the case by exploiting a change in how UK regulated banks had to report their leverage ratio. From January 2016 onwards the seven largest (stress-tested) UK regulated banks became formally subject to a 3 percent leverage ratio which they are required to report to the regulator on a quarterly basis. Until January 2017 these banks could report their leverage ratio based on monthly balance sheet averages, after this date reporting was based on daily balance sheet averages. This change reduced the ability of banks to window-dress their balance sheet at month-end and therefore effectively made the leverage ratio more binding. Four dealers in the gilt repo market were affected by this change, while the other twelve were not. We use a new, transaction-level, supervisory database, the Sterling Money Market database, to examine how UK dealers changed their repo intermediation after this policy change. We focus on the bilateral dealer-client repo market and examine how a tightening of the leverage ratio affects the ability of end-users (e.g. pension funds, hedge funds, insurers etc.) to place cash with dealers in exchange for gilts. We compare for the same client how a UK regulated dealer adjusted its repo intermediation compared to a non-affected dealer. This allows us to isolate the effect of a tightening of the leverage ratio on repo market activity from changes in demand for repo and from other factors affecting repo markets. Figure 1 summarises our main findings. It shows that on average affected dealers accepted 27 percent less repo from their clients after the policy change, while non-affected dealers on average accepted 14 percent more. 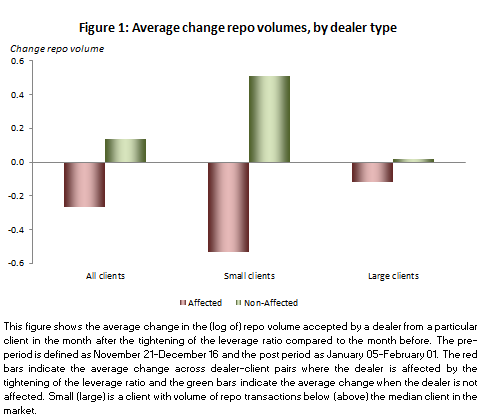 However the impact differs importantly across client type, with small clients experiencing a large decline in repo accepted by affected dealers, while the average decline was much more subdued for large clients. This suggests that dealers subject to a tightening of the leverage ratio withdraw from marginal clients and continue their repo intermediation to clients that have larger franchise value and can provide ancillary business. We further document a reduction in frequency of transactions and a worsening of repo pricing, but no adjustment in haircuts or maturities. A simple back of the envelope calculation suggests that, keeping all else equal and not allowing for the possibility of other market participants stepping in, the withdrawal of affected dealers resulted in small clients being able to place 32 percent, equaling 2.9 billion pounds, less cash in the gilt repo market. However, we find evidence that the withdrawal of affected dealers is partially offset by non-affected dealers increasing their repo activity to these clients. This was primarily done through an intensification of pre-existing relationships, rather than through the establishment of new ones. In line with this, non-affected dealers increased their market share to small clients from 39 to 49 percent after the regulatory change. These results indicate that competing, non-constrained, foreign dealers took the opportunity to capture market share when affected, UK dealers withdrew from the small end-user segment of the dealer-client market. 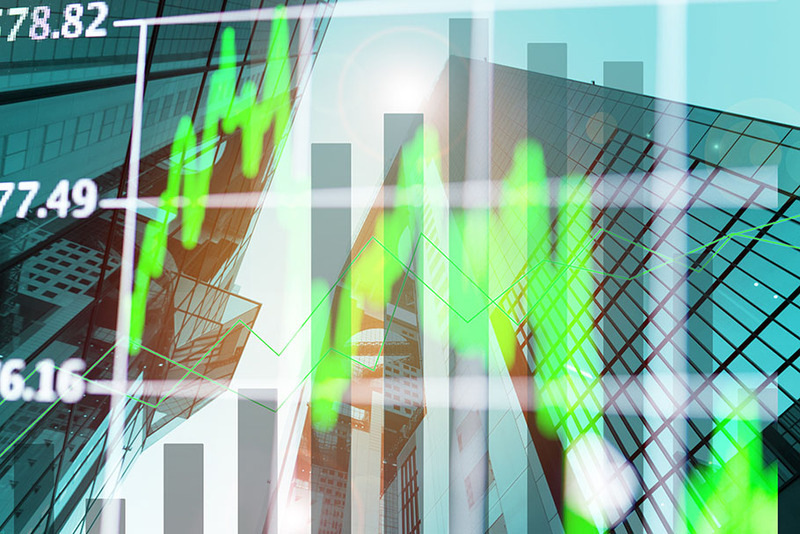 The market therefore seems to have been resilient and adjusted quickly. The leverage ratio has important benefits for the financial system as a whole. It increases the capitalisation of banks and as such mitigates the risk that tax payers have to bail-out banks. Furthermore, there are risks associated with excessive liquidity in repo markets. While the paper does not attempt to quantify the net benefits of the regulatory leverage ratio its results show that the leverage ratio affects small end-users in the repo market and this has important policy implications. The results indicate that capital regulation has the potential to undermine the level playing field of small banks and non-bank financial institutions relative to their larger competitors as the increased cost of engaging in repo activity is disproportionately levied onto them. Without other dealers stepping in, this implies that these smaller end-users ultimately have to pass on these costs to their clients. Furthermore, it can incentivise them to invest their cash more riskily (e.g. longer maturities or against lower quality or no collateral), it can impair their access to derivatives markets by making it harder to access high-quality securities (needed for collateral) through repo and it can increase the cost of hedging interest rate risk. These effects are mitigated if other dealers step into the void as has happened in the UK. While this can alleviate the short-run impact of a more binding leverage ratio it has the potential to make the market more unstable. A stronger reliance on foreign dealers can potentially imply more instability as during times of stress foreign lenders are more likely to flight home (Gianetti and Laeven, 2012) and in these cases tend to especially constrain lending to marginal borrowers (De Haas and Van Horen, 2013). Antonis Kotidis is currently at the University of Bonn and Neeltje van Horen works in the Bank’s Research Hub. Comments will only appear once approved by a moderator, and are only published where a full name is supplied. Bank Underground is a blog for Bank of England staff to share views that challenge – or support – prevailing policy orthodoxies. The views expressed here are those of the authors, and are not necessarily those of the Bank of England, or its policy committees. 1. Has the database been published, the names of the participants having been concealed? Or is it going to be published? If not, why not? 2. You say that ‘there are risks associated with excessive liquidity.’ Could you say a little about what they are?